The following policies apply to all areas of the Student Fitness Center/Vadalabene Center and its satellite facilities unless otherwise stated. The SFC may adjust its hours of operation and close, in whole or in part, for holidays, maintenance, both scheduled and unforeseen, or for events which take precedence over recreational activities according to university schedules. Such closures are to be expected in the normal course of University business and as such, no fees, either in full or in part, will be refunded for such closures, nor should it be expected that members will be provided use of other facilities at such times. Access to the SFC is granted at the access control points by presenting a valid SIUE ID or SFC membership card. Current fee-paying students and current members of the Student Fitness Center, who forget their ID, and have already used their one-time pass (available once per semester), can access the facility by paying $5.00 for a Day-Use Pass at the Reception Desk. Individuals who have special entry needs, due to a physical disability, may use the handicapped accessible entrances, or request assistance from the attendant stationed at the Reception Desk. Contact the Reception Desk to activate your card for the handicap-accessible entrance. Any ID of a suspicious nature, or not belonging to the bearer, will be confiscated immediately. The bearer and/or owner may face disciplinary action through the Office of the Vice Chancellor for Student Affairs and/or Campus Police. Alumni and Family members who have lost their membership ID may purchase a replacement card at the Reception Desk. Please report lost cards to SFC staff as soon as possible so that we may assist you in attempting to locate the card. Students, faculty, and staff must report lost cards to the ID Center, located in the Service Center in Rendleman Hall. The SFC staff reserves the right to ask for additional identification at any time. Guests are required to be accompanied by the sponsoring member and present a valid guest pass for entry. SIUE departments, student organizations, and others must receive permission and reserve facilities through Campus Recreation by downloading the Facility Scheduling Form. Print, fill out all sections that apply to your event, and get signatures. Bring the completed form to the Reception Desk at the Student Fitness Center. Scheduling for SIUE student organizations and departments is available through the EMS reservation system or you can call the Campus Recreation Department at 618-650-2348. Other individuals/groups should contact SIUE Educational Outreach at 618-650-3210. All rental groups are required to clean up and properly dispose of all trash from outdoor fields and/or pavilions. Groups are expected to follow all facility policies, guidelines, and procedures. Any group found not complying with facility rules will be charged for all direct costs to remedy problems and may not be allowed to rent/reserve the facility in the future. Every Friday starting at 3:30 p.m. is “Family Night” in the SFC. Students, faculty, staff, and alumni with SFC memberships are permitted to bring their immediate family members into the SFC and use the recreation facilities at no charge. Current SIUE employees with their SIUE ID are permitted to bring their immediate family members to use the VC Indoor Pool, Racquetball Courts, and Group Activity Rooms on Family Night at no charge. Immediate family is defined as the spouse and the dependent children (up to age 26) of the approved facility user. On weekends, which will end at 5 p.m. on the evening prior to classes resuming, the immediate family of SIUE students is permitted to use the facility at no cost. The adult member must directly supervise all family members under age 16 and remain in the same activity area. All other facility use policies shall apply. Family Night access does not necessarily include access to other special events or programs that may be scheduled in the SFC/VC at the same time as Family Night/Weekend. The following individuals are able to obtain an SFC membership (a membership fee may apply). Enrolled SIUE students with valid SIUE ID – no additional fees. Summer non-enrolled students must have either been enrolled at SIUE during the prior spring semester or must be enrolled in the upcoming fall semester. This membership type requires enrollment verification and can only be purchased Monday-Friday, 8AM-5PM. 100 percent online, dual enrolled or dual admitted SIUE student with a valid SIUE ID, can choose to pay the SFC student membership fee and have a membership for the academic term that in which they are enrolled. Immediate family shall be defined as a spouse/domestic partner and/or dependent children (up to age 26) of the approved facility user only. Spouse members must provide proof of marriage (copy of a marriage license). Domestic partners must complete an Affidavit of Domestic Partnership. Civil union partners must provide proof of a civil union (copy of civil union license). Dependent children must be principally dependent upon you for support (age 16 and above must show proof of age). Dependents under the age of 16, for whom a membership is purchased, will not be issued an ID. A parent or adult sibling who is a member of the SFC must accompany the child, be actively engaged in the same activity, and in the same location as the underage child at all times during each visit. Please note that children under the age of 16 are not permitted in the cardiovascular and weight training areas and children under the age of 12 are not permitted to participate in Group Fitness classes. The Reception Desk attendant will assist those under the age of 16 with access to the SFC as accompanied by their parent/guardian or other SFC member. Memberships are non-transferable and typically non-refundable. In extreme cases, applications for membership cancellation/refund have been granted. Any refund incurs a $25.00 administrative fee. Access the Application for Membership Refund and/or contact Margaret Fredericksen with questions about this process at marfred@siue.edu or 618-650-2375. Any unauthorized ID’s/passes will be confiscated and may result in loss of privileges. Misuse of membership or facilities may result in the membership being revoked. Facilities and services will be available on a regular basis, however, they may be discontinued for a given period of time because of directives from the University, major maintenance projects, severe inclement weather or other unforeseen circumstances. Memberships are not prorated because of these events. It is recommended for new SFC members to attend a free Fitness Orientation within one week of their membership purchase. Orientations will teach you the basics of each of our machines including cardio equipment. Orientations are given by trained staff that specializes in providing safe operating instructions. To sign up for your orientation, please stop by or call the Wellness Center or Reception Desk of the SFC and schedule a time to learn more about all that we can offer you. A Parking Hangtag is required. Non-hangtag holders may park at metered locations. Parking Hangtags are a separate fee. SIUE Students, Faculty, Staff and Retirees are required to obtain the appropriate parking tag through SIUE Parking Service located in Rendleman Hall. Immediate family of Alumni Student Fitness Center (SFC) members or the immediate family of Faculty/Staff SFC members may also purchase a parking pass along with their membership at the SFC Reception Desk. SIUE faculty/staff/retiree with an SIUE ID card. SIUE alumni and SIUE Alumni Association members, with proper ID. Non-enrolled students (during summer term only) who have been enrolled during the previous spring semester. *A receipt will be issued and must be carried on the person at all times. Two guest passes are allowed per member per day. Present photo ID, sign a waiver (parent/guardian signature required if under 18) and pay at the Reception Desk. Carry your receipt with you to access the facility throughout your visit. Guest(s) must be sponsored and accompanied by a member at all times. Guest Passes are good for one calendar day only. Solicitation for guest pass sponsorship is not permitted. Individuals that are permitted to purchase a Day Pass (SIUE faculty/staff/retiree/alumni) are also permitted to sponsor up to two Guest Passes. 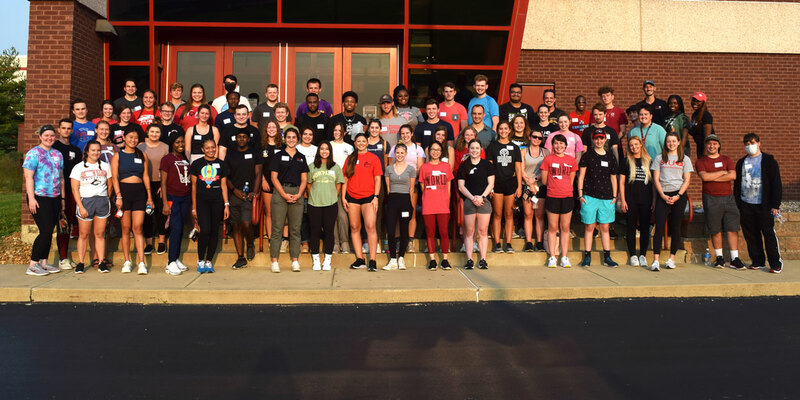 Sponsors are responsible for their guests’ actions while the guest is visiting the SIUE Student Fitness Center, including any damage or loss to facilities or equipment. Any problems with a guest may result in the loss of membership privileges for the sponsor and/or other disciplinary actions. Please note that all Complimentary Passes expire one year from the date of issue. In the event of a fire or other emergency, alarms will sound throughout the facility. Please exit the building using the nearest exit, except in the event of a tornado warning. In the event of a tornado, emergency shelters are located in the hallways next to Equipment Issue. You will be directed by facility staff to the nearest shelter in the event of a tornado emergency. In the event of a power outage, the use of all activity areas and equipment will not be allowed. Do not attempt to use the elevators in an emergency situation. If an injury occurs, please contact a member of the Campus Recreation staff immediately. If you are bleeding prior to, or begin to bleed during any activity, stop the bleeding and cover the afflicted area with a bandage prior to returning to the activity. First-aid kits are available at Equipment Issue, the three Fitness Attendant work stations, the Indoor Pool, and the Reception Desk. Please inform a staff member if blood is on equipment or other facility surfaces. The University and its staff are not responsible for injuries. All participants are financially responsible for all expenses related to injuries and emergency care, including medical care, ambulance and other costs. Medical insurance is strongly recommended for all participants. Use of these facilities is considered a privilege. Individuals not complying with the established departmental policies and procedures may be asked to leave the facility and/or be subject to departmental and/or university disciplinary procedures. All concerns and maintenance needs should be reported to SFC Staff or the SFC Reception Desk. All clothing, bags, phones and other personal items are to be stored in the locker rooms, storage cubbies, on hangers or in lockers; not left around the facility. Furniture or equipment may not be moved without permission of SFC Professional Staff. Rental items not returned in person, by the borrower, or not returned before closing time will incur a late/unreturned item fee. Lost or damaged rental items will be assessed a replacement fee based on the new purchase price for the item. Selling products or services, soliciting for personal gain, or approaching guests for the purpose of obtaining signatures for petitions within the building is prohibited. This includes personal training, coaching and other services not approved through the Campus Recreation Department. Contact sparring may occur only on a scheduled and approved activity basis within appropriate guidelines and management. The use of any type of camera which includes cell phone cameras, video recorders, digital or film cameras is strictly forbidden without permission of an Assistant Director or Director of Campus Recreation. This is a privacy issue and courtesy to our patrons. This applies to all fitness areas, locker rooms, aquatic locations and activity spaces. Communicating (voice or text) on a cell phone is prohibited while engaging in physical activity in all fitness areas (group fitness, strength, cardio and weight rooms). This is a safety precaution, common courtesy and eliminates interference with heart rate monitors and the Cardio Theater sound system. Harassment of other SFC/VC Campus Recreation participants, guests or staff, either verbally or physically, which may include verbal abuse, use of profanity or other abusive language, intimidation, staring at or following another person within the facility, sexual harassment or harassment on the account of race, religion, ethnic background, gender or sexual orientation are strictly prohibited. Abandonment of individuals, both adults and/or children, who are unable to take care of themselves, is prohibited. A responsible person (16 or older) must attend to children under the age of 16. The responsible person must remain within the same activity area of their dependent at all times. In an effort to promote safety, reduce the spread of communicable diseases and prevent additional wear and tear on equipment and machines, all participants are asked to wear appropriate athletic clothing while working out or participating in activities. Participants not wearing appropriate clothing or clothing found to be offensive will be told to adjust as needed or asked to leave the facility. Clothing that covers the chest, midriff, and back (below the shoulder blades) areas must be worn in all fitness and recreation areas. Clothing material must provide adequate coverage to limit direct skin contact. Athletic shoes are required in all activity areas except for the pool and locker rooms. Shoes must have non-marking outsoles, no open-toed shoes, boots, or shoes with metal materials are permitted. Pants or shorts without exposed loose parts, straps or strings are required. Please carry a towel and wipe off any used equipment seats and backs after each use or use the disinfectant and towels supplied. We recommend that you not wear expensive jewelry or anything, which may cause injury or damage equipment. No jewelry is permitted during Intramural participation. All types of tobacco products, vapors, and electronic cigarettes are prohibited. Possession and/or consumption of alcoholic beverages are prohibited in the SFC/VC except during designated functions in designated areas. Food and drink (other than water) may not be brought into activity areas, except during designated functions. Water in a water bottle (not glass) is permitted. Please help keep the facility neat and appealing to all users by properly disposing of trash either in the proper recycling container or trash cans. Use of the facility while under the influence of alcohol and/or drugs is prohibited. SIUE students, alumni, faculty/staff and SFC members may register for a free small locker room locker for the academic year through Equipment Issue. Contents may be left overnight in these small lockers if the locker is registered through Equipment Issue. Locks are not provided but are for sale or for daily rental in our Equipment Issue Pro Shop. Full-height lockers are available for rent which includes a built in lock. Registration and rental are on an annual basis and cannot be pro-rated. Free and Daily-Use lockers must be unlocked and cleared of all contents by the end of the spring semester in May. Lockers not emptied will be cleaned out by SFC staff. All items will be confiscated and stored in Equipment Issue for you to pick up. There will be a fee to recover confiscated items. Items will be kept for 30 days then disposed of. If items are left in a Daily-Use Locker overnight those items will be confiscated and a fee will be required to reclaim confiscated items. Locks that are left overnight on Daily-Use lockers will be cut off. SIUE is not responsible for lost or stolen articles. Bringing valuables to the facility is strongly discouraged. Always use a lock, even when in the shower. Users who do not wish to use a locker room locker may use the free coin-return lockers or other free lockers located within the Student Fitness Center to secure their belongings. The Campus Recreation staff is not allowed to hold any items or valuables for users. Clothing and bags are to be stored in the locker room lockers, storage cubbies or other available lockers. Contact the staff at Equipment Issue to inquire about lost items. Cash, credit cards, driver licenses, cell phones, laptops and other items of obvious significant value will be turned over to the SIUE Police Department. SIUE ID cards (excluding alumni and family SFC members) that are not claimed within 48 hours are sent to the Service Center located on the first floor of Rendleman Hall. Other lost items will be stored for at least 30 days. Campus Recreation and SIUE are not responsible for lost or stolen items. Due to the inherent risks involved in using fitness training equipment, you must be 16 years of age for all fitness training areas. This includes all weight-training and cardiovascular equipment within these areas. Users not familiar with the operation of the exercise machines should seek assistance from the Fitness Attendant. Open-toed shoes and chalk are strictly prohibited. Liquid chalk, wrist straps, and weight gloves are permissible and available for purchase at Equipment Issue. Non-wearable, personally owned fitness equipment that contains an increased risk to self or others is not permitted. Examples of wearable fitness items that are permitted include lifting belts, lifting specific shoes or gloves. Excluded items include personally owned resistance bands, ab rollers and/or chains. Campus Recreation provides resistance bands for use in our fitness areas. The machines and weights should be used with care. Dropping plates, dumbbells, and weight stacks can cause injury, facility damage and is disrespectful to other users. If you have to drop the weight, only bumper plates, when used on an Olympic platform or with appropriate self-space on SFC Court 4, can be dropped from no higher than waist height or as needed for safety. Users should be courteous to others by limiting the length of their workout at a singles station and by observing posted time limits when others are waiting. Weight Room etiquette is to allow others to work in. See a Fitness Attendant if you need assistance. If weights, pulleys or other parts become damaged or jammed, users should not attempt to fix or free them without staff assistance. Report the problem to the Fitness Attendant or Reception Desk staff. Users should always inspect equipment for loose, frayed or worn parts before using. If in doubt, do not use the equipment and report the problem to the Fitness Attendant or Reception Desk staff member. To reduce the chance of injury, users should keep head and limbs clear of weights and moving-parts at all times. All fitness and portable equipment is to be returned to appropriate storage locations after use (i.e. weights must be re-racked). Weights are not to be propped against the walls, pillars, or mirrors due to the risk of damage or injury. Spotters are recommended at all stations in the free weight areas. A Fitness Attendant or Facility Supervisor is usually available to offer assistance within their ability. Utilization of collars when free weight lifting is recommended. Weights, medicine/kettle/stability balls can be used on SFC Court 4 only when other sporting activities are not present. No equipment is permitted for use on the hardwood floors. All equipment must be returned to its proper locations. Special programming may be scheduled for the SFC Lounge TV and may disrupt the regular programming schedule. Sporting events, health, and wellness programs will have high priority. Station selection will be based on a first come, first serve basis with majority rule. OnlySFC Staff members are permitted to operate the TV controls. The TV’s in the Fitness Areas can be listened to through a Cardio Theater system using your own FM receiver, tuned to the appropriate posted frequency for the channel you want. You can also read the CCTV display at the bottom of the screen. Changing the volume or channel on any TV’s is prohibited as it disrupts the Cardio Theater transmitters. Radio stations are set by staff only based on format type of the station and the social acceptability of the material. Programs with offensive language and political talk shows will not be played. Personal music players w/ headsets are permitted. Playing music in a way that others can hear is not permitted. Dunking, slapping the backboards, and hanging on rims or nets is strictly prohibited due to the risk of injury and potential damage to the equipment. Violations of this policy will result in immediate ejection from the facility for the rest of the day. Repeated violations may result in suspension from the facility. The courts may be used for designated activities only as indicated by the formal recreation schedule. Expectoration (spitting) on floors, walls, or support beams, is not permitted. Cuspidors (for spitting) are located adjacent to water fountains in the gym for your convenience. All open challenge play shall be handled in a manner fair to all wishing to participate. While others are waiting, the same two teams or groups may participate for a period of time not to exceed one hour. Setting up and removal of equipment is handled solely by the SFC Facility Staff. Ask for assistance if the court equipment needs to be set up, removed or adjusted. SFC Court 3 - Badminton, then half-court Basketball, Volleyball or other approved activities. SFC Court 4 – See table below - Space can accommodate Soccer, Hockey, Tennis, Basketball and other activities. SFC Student Activity Center Courts A & B - Campus Recreation Intramurals and Club Sports will be prioritized along with other group reservations/rentals. Drop-in recreation is welcomed for basketball, volleyball and badminton when the space is open. Reservations for SFC Court 4 can be made no more than 48 hours in advance. SFC Court 4 can be reserved only at select times/days, for one hour, per group/activity. Phone 618-650-2370 or visit the Equipment Issue office to reserve SFC Court 4. Reservations start on the hour. SIUE Club Sports and other SIUE student organizations can also reserve SFC Court 4 through the Club Sports office (618-650-3274) or the Campus Recreation Reservationist (618-650-3236) with more than one week advanced notice, following the priority schedule. Your e-ID or membership number and phone number will be requested at the time of reservation to verify your membership, and so we may contact you regarding any conflicts. All court reservations not claimed within 10 minutes after the hour are forfeited and maybe claimed by any eligible user for the remainder of the hour. The following rules are necessary to support the safety of users and to preserve the facility. All rules from Courts 1-3 shall be applicable to this area as well. Drop-in play is permitted whenever the court has not been reserved. Please adhere to the posted SFC Court Priority Schedule & Reservation Policy, or ask a staff member for assistance. All roller skaters/bladers must wear a properly secured helmet. Elbow and knee pads are recommended for roller skating/blading, and face masks are recommended for hockey. Indoor hockey pucks/balls, unmodified tennis and Whiffle balls are allowed. Cricket balls, baseballs or any other hard projectiles are not permitted. Black tape on hockey sticks, black pucks or skates with toe and/or heel stops or are not allowed. Roller skates/blades are only allowed on the rubberized surface and may not be worn anywhere else in the facility. Only Student Fitness Center staff may move or set up equipment. Ask for assistance at Equipment Issue or the Reception Desk. Please do not leave personal belongings on the floor or on the nets. Items may be kept within the seating area. Campus Recreation suggests that roller hockey teams be limited to a maximum of three skaters and a goalie per side. Cricket play is permitted, but only with a whiffle ball (available for free checkout from Equipment Issue) or an unmodified tennis ball (available for purchase from Equipment tIssue). An outdoor cricket ball is not permitted to be used in any way, inside the Student Fitness Center. Scheduled programming has priority usage of these areas. These rooms are available for individual workouts during free periods. These rooms may be “drop in” utilized by a group for use for up to one hour at a time. If no other group is waiting to use the room, the current group may continue to use the room for another hour. Class size may be limited due to equipment and/or space requirements. Please be courteous to other members and arrive on time for classes and programs. Campus Recreation reserves the right to cancel any class on the basis of low attendance, instructor absence, inclement weather, or other circumstances. Group Fitness class participation is available to all members and paying guests age 12 and above at the discretion of the instructor. Any participant under the age of 16 must have their parent/guardian present and actively engaged in the same class and facility area as their child. Group Fitness instructors may modify or limit participation as they feel necessary. All participants must also be able to appropriately use applicable equipment, according to the Group Fitness instructor. For example, participants must fit appropriately on an indoor cycle in order to take a cycling class. Reservations are recommended for groups to be guaranteed space, but these rooms can also be “drop-in” utilized by a group. Drop-in use will switch on the hour if a group is waiting. If no group is waiting and there is not a reservation on the next hour, the original group may continue to use the space until there is a reservation or another group arrives. Once another group arrives and communicates with the Facility Supervisor, the space will turn over to the waiting group on the hour. Reservations not claimed within 10 minutes of the scheduled time will be forfeited and that time may be used for drop-in use until the top of the hour or until the next scheduled reservation. Safety goggles are recommended for racquetball. Racquetball racquets that have bumper guards and wrist ropes/straps are recommended. Court shoes are recommended. Any athletic shoes that mark the floor are prohibited. Shirts must be worn at all times. See SFC Attire Policies. Courts may be reserved for a single hour, up to 48 hours in advance starting on the hour at Equipment Issue or by calling 618-650-2370. Players or groups, may have only one reservation per day. Your student identification number or membership number and phone number will be required at the time of reservation in order to verify your membership status and contact you for scheduling changes and conflicts. All court reservations not claimed by 10 minutes after the hour are forfeited and may be claimed by any eligible user. If you have reserved a court and someone else is using it and will not relinquish it to you, ask SFC Staff for assistance. Users wishing to play Wallyball, should ask for the set-up from Equipment Issue window. While using these facilities, please abide by the following rules at all times. Hitting golf balls is not allowed. Do not park or drive on the grass. Clean up and properly dispose of your trash from the facility. No metal or ceramic cleats. All tobacco, electronic cigarettes and/or vapors are prohibited. All University parking policies apply. All bulletin boards within the SFC are monitored by the units and departments housed in the facility and most are reserved for departmental marketing and programming. Open “University Community” bulletin boards are available in the hallway east and south of Equipment Issue. Out-of-date and inappropriate material will be removed. Posting of all notices and flyers must receive prior approval from the Kimmel Leadership Center. Individuals who damage the facilities or equipment will be responsible for the repair or replacement cost. Individuals who abuse or damage the facilities, or fail to follow established procedures, may forfeit their right to use the facility. These policies and procedures are established with the safety and enjoyment of all participants in mind. Decisions rendered by the professional staff on any infraction may be appealed to the Campus Recreation Advisory Committee. Campus Recreation phones cannot be used for any incoming or outgoing patron phone calls. An on-campus phone is located at the west end of the VC lobby near Equipment Issue. Please be courteous and limit calls to three minutes when using the on-campus phone when others are waiting or during emergency conditions. Proper ID. must be presented to the lifeguard before using the pool. An approved swimsuit is required. Synthetic material (rash guard) shirts are also permitted over a swimsuit. No hazardous activity or inappropriate behavior is allowed. Examples include, but are not limited to, dunking other participants under water, and prolonged breath-holding or jumping/diving into an area where another participant is swimming. Members may bring only immediate family members into the indoor pool during family swim periods, unless a guest pass has been purchased. Immediate family is defined as spouse and children only. Access to the SIUE Climbing Gym is granted by first presenting a valid SIUE ID or SFC membership card at the Equipment Issue window, or through the purchase of a Guest Pass from the Student Fitness Center Reception Desk. Then all climbers must sign in with a Climbing Gym staff member. All climbers must have a valid waiver on file, renewed every year. All children under the age of sixteen must have direct parental supervision. Children that are at least four years of age are permitted to boulder only with direct parent supervision and spotting. Children aged five and up to fifteen are permitted to boulder with direct parent supervision and spotting and can climb on belay if they meet harness fitting requirements. Children sixteen years of age and up are permitted to boulder with a spotter and can climb on belay if they meet harness fitting requirements. Participants must be at least eighteen years of age to be belay certified. Harnesses must be commercial products designed for climbing as identified by the Climbing Gym staff. Climbers assume all responsibility if their own equipment is used. Gri-gri’s are not permitted. Climbers must use proper climbing equipment when using the climbing gym. Harnesses, climbing shoes, and chalk bags may be checked out at Equipment Issue. Harnesses must be double-backed at the waist and leg loop buckles when worn by the climber and belayer. Shoes must be worn. No barefoot climbing, open-toed sandals, hiking boots or other hardsoled shoes. No formal teaching or instruction is allowed, except by the Climbing Gym staff. The option of background music is to be controlled by Campus Recreation staff only. No climbing is permitted with personal music devices, or ear buds/phones of any kind. Playing of personal music in any way that others can hear is not permitted. Water in “sport bottles” is allowed in the climbing area. No other food, drink or gum is allowed in the Climbing Gym. Drugs, alcohol, all tobacco products, e-cigarettes/vapors and objectionable language are not permitted. The SIUE Climbing Gym staff and Facility Supervisors reserve the right to expel any participant judged to be non-compliant, unsafe or objectionable to others. Solo climbing is not permitted, and all climbers must be protected by a top rope belay or auto belay unless bouldering under the designated bouldering line. All lead climbing is not permitted during open recreation time. Lead climbing must still be on belay and is only permitted during specified training or event reservations. Bouldering with any part of the body above the red line is not permitted. Spotters are recommended when bouldering. The adjustment or rearrangement of holds is not permitted. The holds will be changed periodically by the Climbing Gym staff. Suggestions may be directed to the Climbing Staff. Belayers must have both hands on the rope and their eyes on the climber at all times. Backpacks, book bags, and other personal items are to be kept organized and clear of the landing zones, which include all of the padded floor areas. We recommend that participants use the locker rooms and other free personal and secure storage areas located within the Student Fitness Center. Boating is not permitted on Cougar Lake. Only University-owned water craft are permitted on Cougar Lake during University-sponsored events or activities. Cougar Lake watercraft are not permitted to be used on any other body of water in order protect and preserve the Cougar Lake ecosystem. Swimming or wading is not permitted in the Cougar Lake Recreation Area. Fishing is allowed in Cougar Lake with a valid Illinois fishing license. No alcoholic beverages are allowed at the Cougar Lake Recreation Area. Pavilion rental does not provide the user with access to the Cougar Lake Pool or bathhouse.